The Lesser Water Boatman has two pair of wings: the front wings and the back wings. The front wings, which are somewhat sclerotised, serve as a cover and are sometimes called hemelytrae, in comparison with the tougher shielding front wings or elytrae that beetles have. The front wings are attached to the second segment of the breast (mesothorax) and when in rest they lay against the shield of the first segment of the breast, the pronotum. The wing has three distinguished parts: clavus, corium and membrane. The membrane is a colourless, transparent part of the wings of most bugs, the name hemipterae (halfwinged)for bugs is based on that fact. But the front wing of the Lesser Water Boatman is overall colored as you can see. By moving the mouse pointer over the picture you can see how the wings look when they lay over each other. (Maybe you must click once on the picture). Notice the light margins of the wings. They have the shape of a flattened half pipe. In combination with the side margins of the abdomen they build two flat tubes in which extra air is stored, and which decorate the Lesser Water Boatman as a silver striping. Under the front wings the second pair of wings lies folded up. One might call these membraneous wings the real wings, because the insect uses them for flying. During flying the front wings are held stretched out like, for example, a lady beetle does. On the right my interpretation of a flying Corixa. The front wings are covered with a membrane, of which the cells are visible as a honeycomb structure on the picture on the right (please move the mouse pointer above the picture, if necessary, click on it). The two different lighting angles make the cells stand out in the pictures. Notice the microscopic animal attached to the wing margin: a protozoan probably, more on the page describing the abdomen. 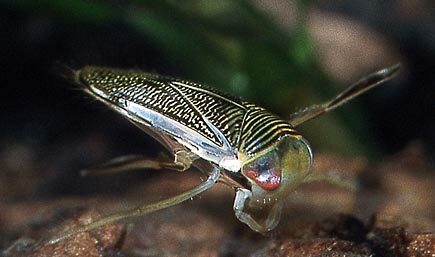 Some Lesser Water Boatman species have front wings with a characteristic ribbed surface. Different species may have different wing spots, but these may vary also within the same species, so they are not suited to recognise the different Lesser Water Boatman. On the pictures under right the wing patterns of two common species. Then finally a picture with a clear presentation of the air-filled wing margin. The little drawing under it shows that marked in blue. Next page: Structure, general (first page of this series).